A rhino had to be rescued by firefighters after becoming stuck in a tyre at Edinburgh Zoo for about two hours. 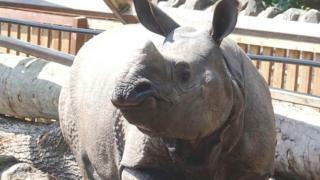 Qabid, a two-year-old male rhino, managed to get his head and leg trapped. Firefighters who were called out on Sunday evening used cutting gear to free the stricken mammal. A Scottish Fire and Rescue Service spokeswoman said: "One zookeeper said the fire service were their last hope." SFRS group manager John Hanlin said: "The crew did a great job in a very unusual situation. "Edinburgh Zoo staff informed me that this event wasn't the first time he had got himself stuck but he usually manages to get himself out - he very clearly wasn't so nimble or lucky on this occasion." Darren McGarry, head of living collections at Edinburgh Zoo, said: "Our greater one-horned rhino Qabid loves to play with his tyre, it's one of his favourite things to do. "He managed to get his head and a leg stuck while playing and we had to contact the fire service for assistance to use their specialist cutting equipment. "The tyre was safely removed and Qabid is doing fine. We would like to thank the fire service for their help." In 2016, firefighters were called to the zoo to help another rhino which had toothache.